This photo is of the altar in the church where Jen and Zach got married. 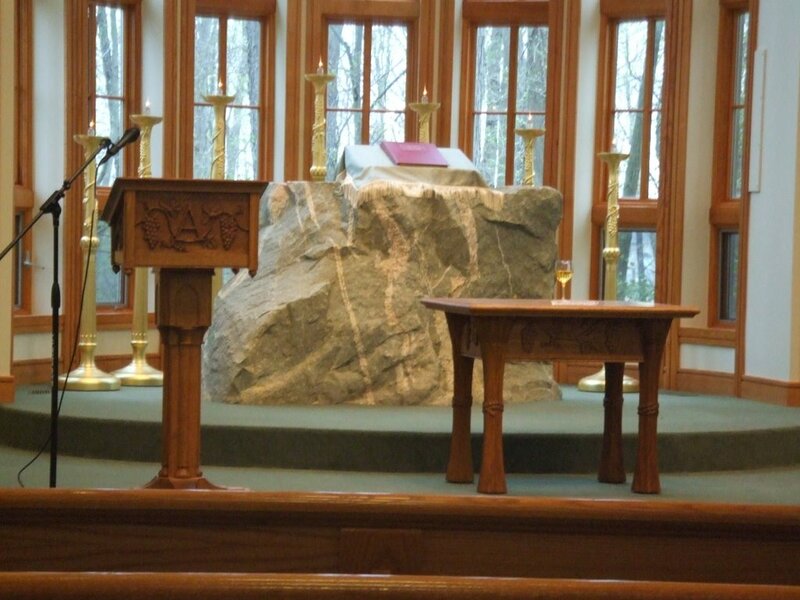 A Bible rests on a stand on top of this large rock. When I saw this rock, immediately I thought of the hymn. On nothing less than Jesus' blood and righteousness are we to build our hope. 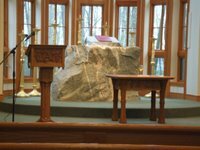 On that beautiful Saturday in April in Detroit, the rock at the altar symbolized the hope that Jen and Zach have for their individual lives and for their life as a married couple. They truly have embraced what it means to covenant with God and with each other (and also with the body of Christ) in order that their marriage give glory to Him--to reveal who He is, that He exists, that He is God, and that He rewards those who obey Him as a love-response to His love. "When darkness seems to hide His face, I rest on His unchanging grace; in every high and stormy gale, my anchor holds within the veil" (No. 283, The Baptist Hymnal, Nashville: Convention Press, 1956). "Within the veil" is the holy of holies in the tabernacle/temple, where the mercy seat is, where God's presence was met by the high priest. The true holy of holies is Christ Himself, who is our High Priest. Thus, my anchor is with Him and in Him. I am anchored in His grace, which never changes. It doesn't shift with the wind and rain and lightning and waves of storms. And darkness only seems to hide His face. That darkness can be many things...doubt, fear, confusion, circumstances, God's silence. But ever He is with me, even if I cannot trace His face. I can still trust His heart. He is rock-solid trustworthy. "I dare not trust the sweetest frame"--->no human---no matter how dear to me, not even myself---can hold me up. No human is perfectly reliable. Only on Jesus can I always lean. Marriage is tough. I've witnessed this in marriages all around me. But I have hope for my future marriage (I'm believin' that one day it will happen!) and I have hope for the marriages of my family and friends---because God IS hope! He is able to change human hearts, which are more stubborn than the mountain that Jesus said we could order to throw itself into the sea. He who began a good work in me---and in you, brother or sister in Christ---will carry it on to completion till the day Jesus returns (see Phil. 1:6). If we hunger and thirst for righteousness, we will be filled (Matt. 5:6). And since our Father in heaven is perfect, He knows how to give and will give us good gifts (Matt. 7:11). We continue to seek Him and His righteousness (Matt. 6:33) because HE works in us to will and to do what pleases Him (Phil. 2:13). This is the solid Rock upon which Jen and Zach are building their lives. They can be successful in their marriage because of the One who makes it possible...and who DOES it. As they lean on Jesus, they can fulfill 1 Corinthians 13; Galatians 5:22-23; and Micah 6:8. And not only can Jen and Zach...but we all can too. Not because of ourselves...but because of Him (Ephesians 2:8-10). May you be encouraged today!